MUSIC: In recent times Sri Lankans have had very little to crow about besides harping over the grandeur of their past. Outside of our shores, we are known mostly for our “tea, tourism and terrorism”. There has appeared mercifully on the horizon a bright new star in the last decade to lift us above our contemporary doom and gloom: he is sitarist Pradeep Ratnayake who has performed to tremendous acclaim both at home and abroad. Ratnayake, a Senior Lecturer in the Department of Languages and Cultural Studies in the University of Sri Jayawardenepura, obtained his Master’s degree in Music with a First Class from the Visva Bharati University, Santiniketan, India in 2003. It is little known that he qualified to enter a university in Sri Lanka having offered Pure Mathematics, Applied Mathematics, Chemistry and Physics for his G.C.E. Advanced Level examination. Physical Science’s loss has been music’s immense gain. Ratnayake has had a glittering career to-date in music. He obtained First Division passes in all examinations leading to a Vadya Visharada from Bathkande Vidyapeeth, Lucknow, India, during 1978-1984. In 1983 he secured the First Place in instrumental classical music in the All Island Inter-School Music Competition. The Indian Council for Cultural Relations awarded Ratnayake a scholarship in 1992 to follow a course of study leading to a Bachelor’s degree in music at Santiniketan. He graduated in 1996 with a First Class. Upon first returning from Santiniketan in 1996, Ratnayake embarked on a series of musical concerts, a creation of his own, titled Pradeepanjalee. Sponsored by the bi-national United States-Sri Lanka Fulbright Commission (US-SLFC) that administers the Fulbright educational exchange programme between the two countries, Pradeepanjalee XI is scheduled to take place at the Bishop’s College auditorium on 27 March. This will mark the second occasion on which the US-SLFC will have sponsored a Pradeepanjalee concert. The first was in 2004 when as part of the 50th anniversary celebrations of the Fulbright programme in Sri Lanka, Pradeep Ratnayake and Friends brought together a fascinating repertoire of compositions that included re-workings of Sri Lankan folk melodies, Classical Indian Ragas and the Music of John Coltrane and George Gershwin arranged for the fusion of both Eastern and Western musical instruments. In these Pradeepanjalee concerts, Ratnayake showcases Indian Classical music to begin with and as the concert progresses he turns to his own compositions in which he uses elements of Eastern, Western and Sri Lankan music. As Tissa Abeysekara observed in a speech at the recent 10th anniversary celebrations of Pradeepanjalee, she is the force that makes possible for the music and notes to flow from Ratnayake’s sitar at his concerts which seem to happen almost by themselves. In reality however, as we know only too well, much energy is expended on these productions. The zest and devotion of Madhubashini and those of the respective parents of the couple have been and are indispensable to the many successes of Pradeepanjalee. 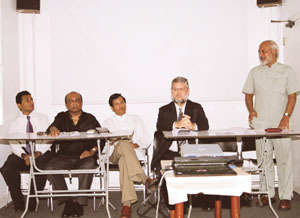 It is the Goethe Institute that helped Ratnayake launch the first ever Pradeepanjalee in 1997 by hosting it at 35, Gregory’s Road. From here on end, Ratnayake has gone from strength to strength. His next performance was at the ILO Auditorium in Geneva, Switzerland. It was the 50th anniversary of the Central Bank in 2000, and we dared the young musician, Pradeep Ratnayake, to compose a fitting memorial to the bank in music, as Guiseppe Verdi did to immortalise the opening of the Suez Canal by his opera, Aida. Ratnayake took up the challenge and what he produced - Indrakeelaya - is a magnificent tone poem, which yet reverberates in our ears. Delving deep into our cultural roots and the heroic poems of other cultures, Ratnayake’s composition on the theme of a phoenix rising from the ashes, is a tribute to the bankers who survived a devastating attack on the premises a few years before. Ratnayake’s Indrakeelaya (the unshakeable) is widely acknowledged as a classic. Ratnayake over the years, has performed to the thrill and delight of audiences in Abu Dhabi, UAE, at the UN Headquarters in Geneva, Asia Society in New York, at the Kennedy Centre in Washington D.C. and at the Vienna Musikverein in Austria. Other highlights in Ratnayake’s flourishing career to-date include his performance as Soloist in Lalanath de Silva’s Sitar Concerto. De Silva, Associate Conductor of the Symphony Orchestra of Sri Lanka, composed this concerto inspired by Ratnayake’s playing. The Sitar Concerto has been performed jointly by the Bombay Chamber Orchestra and the Symplony Orchestra of Sri Lanka both in Bombay and Colombo. 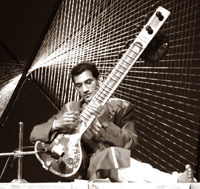 Ratnayake has played western classical music on the sitar as part of his experimentations. He has played the second violin part of Bach’s Double Concerto for Violin and a mandolin part on the sitar in Vivaldi’s Concerto for Two Mendolins. Ratnayake has composed and directed the music for Lester James Peries’ film Wekanda Walauwwa and Linton Semage’s Mage Wam Atha, the first ever Sri Lankan film to be screened at the Locarno Film Festival in 2002. He has produced several Compact Discs containing his music titled Indrakeelaya, Roots and Sitar Gee Rava. Visva, a CD containing the music of the concerts Ratnayake performed in the United States on his 2005 tour of that country, will be released at the forthcoming Pradeepanjalee XI sponsored by the US-Sri Lanka Fulbright Commission. Ratnayake is engaged in an effort to give a new identity to his sitar - - a Sri Lankan identity which can hold its own in the international world of music. He seeks to do so by crossing cultural boundaries and travelling effortlessly across styles, idioms, forms and traditions as Nihal Rodrigo has observed. The sitar has become a magic wand in his hands. Those of us fortunate enough to grow old along with Pradeep Ratnayake are indeed a blessed lot for the best of this wonderful sitarist is yet to be. CINEMA: Udayakantha Warnasooriya has taken a new turn in his cinematic career with his latest release - Ran Kevita. His 12th creation is set to be screened at Savoy, Wellawatte, and islandwide from March 16. Presented by Millennium entertainment and distributed by E.A.P. Films, this movie features two main child actors, Hisham Samsudin and Harith Baddewala. A line up of popular actors and actresses contribute to the story. Shot in the remote areas of Embilipitiya, Sooriyawewa, and Tissamaharama, the film includes several scenes starring animals such as bush-babies, snakes and donkeys. Another specialty of the movie is that it includes a three dimensional digitally animated character - Gopalu Yakka, which is a first in the Sinhala cinema. Filled with a blend of humour, seriousness, fantasy and education, keeping you entertained while putting forward certain meaningful aspects of life, Ran Kevita is one for the kids though those in their elderly years will find it hard to resist as well.